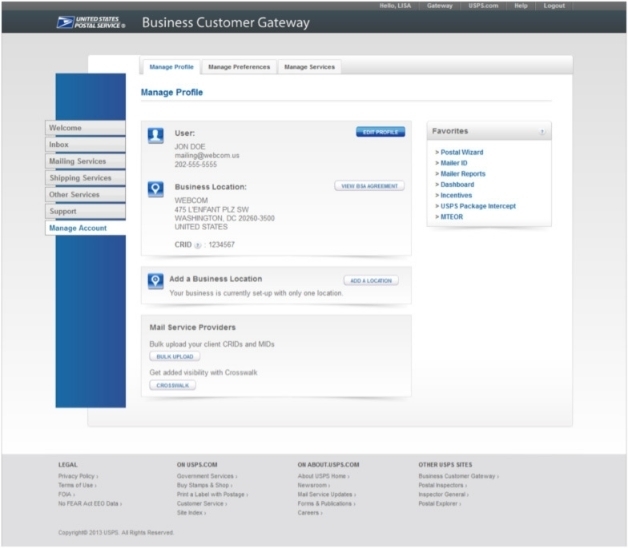 PROJECT: To redesign the existing USPS Business Customer Gateway (BCG) interface to make the application more usable, intuitive, and customized for different user-types. This updated application also needed a new streamlined signup process in addition to a more refined method to add new locations to an existing business. 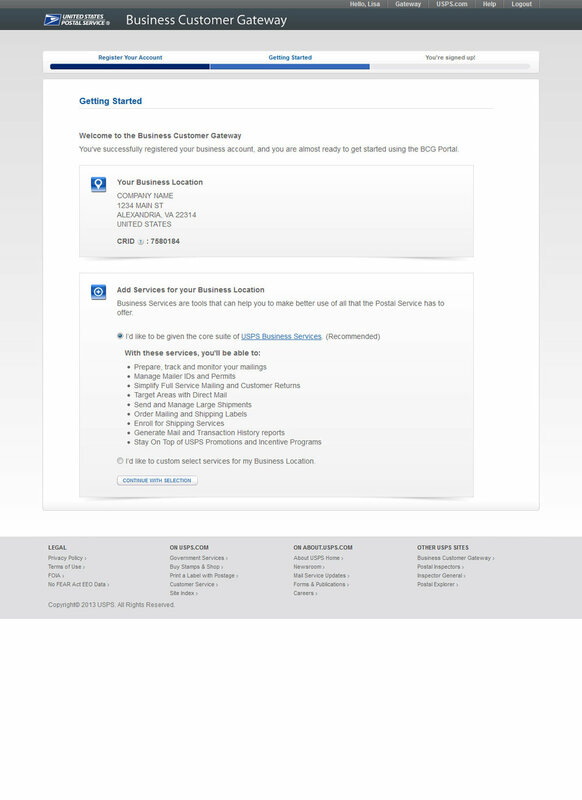 Maintaining USPS branding while diverging slightly from the USPS.com® site just enough not to complicate the user-experience when a user goes between the internal sites. Customizing the user-experience for the different user types, so that novice users aren't overwhelmed and that experienced users have the controls and options they need to perform their tasks most efficiently. Working as a front-end developer with a development team in a different location — we used MeetingPlace screen sharing often. 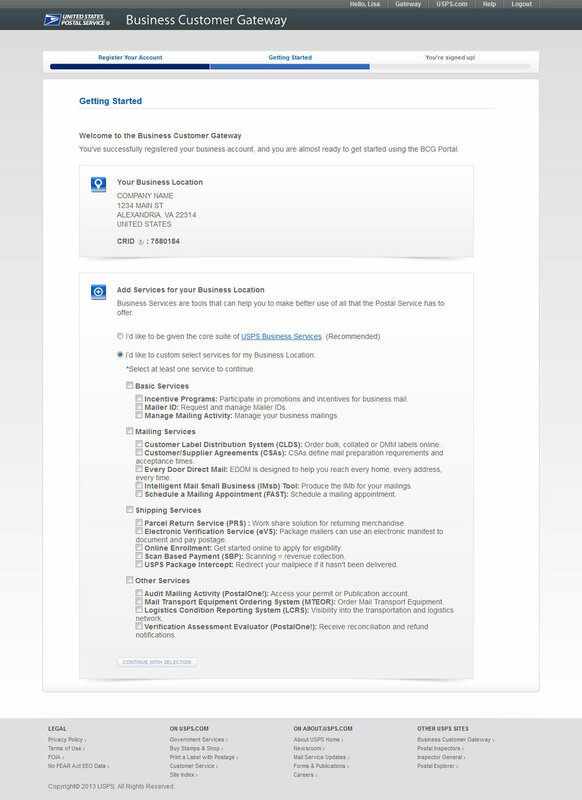 The BCG application tags the users along with their company profile: Single User-Single Location (SS), Single User-Multiple Locations (SM), Multiple User-Single Location (MS), or Multiple User-Multiple Locations (MM). The biggest challenge was to consider and convey that some of the MM users weren't necessarily more sophisticated than the SS users, and we used clear personas to help develop that idea and ensure that we covered the largest percentage of users. Once customers completed registration or signed in, they saw a dashboard custom to their business and type: single/multiple users + single/multiple locations. Early on in the sprints, we established the look and feel of the application with high fidelity mockups. After settling on a style with stakeholders, I coded the application in HTML/CSS, using a few reusable styles and assets, like the progress bar, from USPS.com. Then, 2 weeks in advance of the development team's sprints, I delivered the front-end code and any further integration elements to the agile development team that was working with USPS in St. Louis. We completed the full application in about 10 sprint cycles. Even though we didn't get to test and learn firsthand, we heard great feedback from USPS based on their customer experience.